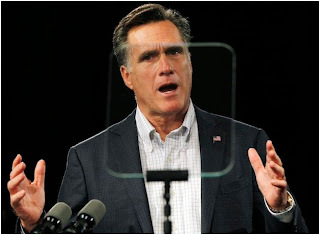 DENVER, COLORADO - (@TheComedyNews) - After the debate last Wednesday, the Romney campaign unveiled its latest tool from their presidential candidate by default sandbox: a supposed "gaffe proof" teleprompter. The crude design is simply two etch-a-sketch units super glued together and duct taped around a mic stand. The teleprompter, which sources close to the campaign say is designed to keep Romney's responses within time limit and on message during the debates, is comprised of two messages. One reads "sorry=bad" while the other reads "no specifics." And if that's not enough, two secondary etch-a-sketches are on stand-by and read, "You are rubber, Bush is glue" and "blame B. Hussein Obama." These teleprompters are seen by many as an example of the type of fiscal spending the Romney presidency could bring to Washington. Representative Darrel Issa agreed by saying, "Romney's campaign has saved more money by following conservative policies, while the POTUS has a tax payer-funded $2000-a-day burn rate----- and that's just for shopping sprees and Bieber tickets for the FLOTUS and those two children of theirs." The Romney camp hopes the prompters will ensure facts and correct context will be injected into the debates. Fears have been growing in the campaign that Romney's words and postmortem jokes taken as actual statements by news affiliates will be treated with the same prejudice Barack Obama receives when he uses a teleprompter for speeches. The Obama campaign lobbied a weak counter argument, similar to the President's debate performance, to this momentous presidential race shake-up by issuing the following statement: "teleprompters aren't typically used in debates but....okay, fine." Either way you slice it, the second presidential debate just got more DVR worthy.